A recent update to a continuing study finds a link between bailouts and the lobbying of the financial industry. It is sometimes asserted that the housing boom of the first half of the last decade was largely a result of easy credit by the Federal Reserve – that low interest rates made it too easy for too many people to borrow to purchase a new, bigger home. But interest rates were only a bit lower in the decade than they were in the 1990s, when there was not a housing boom. By the standards of the 1990s, one might expect the somewhat lower interest rates of the last decade to elevate housing prices only a bit (as I have estimated; Edward Glaeser of Harvard and his co-authors have, as well), rather than the much sharper increase that actually occurred. It’s also true that bank lending standards were relaxed during the housing boom, with risky borrowers allowed to purchase homes, and all kinds of borrowers allowed to purchase homes with little money down. But as Professor Glaeser has frequently noted, for instance in this post, the housing boom is not primary explained by easy credit. Even if interest rates and lending standards had been the same in the last decade as they were in the 1990s, however, a crisis might still have been brewing, because interest rates should have been higher during the housing boom than they were before. Housing prices were elevated during the boom (in part for the reasons cited above) and, by comparison with the 1990s, this made it more likely that — if and when housing prices came back down — even high-income borrowers making 20 percent down payments would default. With default more likely, interest rates needed to be higher, even for high-income borrowers putting 20 percent down. The study, by Deniz Igan, Prachi Mishra, Thierry Tressel, three economists at the International Monetary Fund, suggests that implicit subsidies and a lack of regulation helped make it possible for lenders to offer lower rates on mortgages that were increasingly likely to default. My fellow Economix blogger Simon Johnson has also noted the interplay of political influence on regulation and finance. The study by the I.M.F. economists found that the heaviest lobbying came from lenders making riskier loans and expanding their mortgage business most rapidly during the housing boom. The loans originated by those lenders were, by 2008, more likely to be delinquent. Most important, lobbying meant access to tax dollars. The lenders lobbying more heavily were 7 percent more likely to receive bailout funds, received larger amounts of those funds, and enjoyed a 27 percent greater increase in their market capitalization in October 2008, the month the bailout program was announced. The authors did not disentangle the path by which lobbying brought forth bailout funds, but it is likely to have followed some combination of political access enjoyed at the time and the lobbying lenders’ assertions of need — created by the lax lending that had gone before, itself facilitated by lobbying during the housing boom years. Nobody knows for sure how much of the blame for the housing boom can be put on the federal government, but we’re starting to see how political influence was associated with mortgage lending and, ultimately, with taxpayer subsidization of delinquent and defaulting mortgages. What Might Cause a Two-Track Recession? Census Bureau data on employment by pay level cast doubt on credit-crunch and demand-based theories of the recession. One theory is that a credit squeeze left businesses short on funds, and they responded by cutting payroll, their major expense. Indeed, the bank bailouts were rationalized on the grounds that a bailout would help employers maintain their payrolls. If cutting payroll spending had been the primary motivation of employers, then they should have cut deepest among their most expensive employees. Firing one person making, say, $2,000 a week saves more than firing three people making $600 a week. It is true that part-time employment, which is typically low-paying, increased significantly during the recession. However, last week I showed Census data suggesting that employment of people making more than $2,000 a week may have been greater in the 12 months after Lehman Brothers failed than it was before, even while employment of people making less than $2,000 a week fell several million. Hiring more high-paid people is not a way to reduce payroll spending. Moreover, payroll spending now exceeds what it was when the recession began, yet employment remains millions lower. Apparently, payroll spending is not enough to bring those jobs back. Another theory of the recession is that it was caused by a lack of demand — fewer employees were needed because employers were selling less to their customers. The low-demand theory is a good description of a couple of industries, like manufacturing and home construction, but if it described the economy as a whole we would have seen all types of employment cut, not just employment of people making less than $2,000 a week. Another set of theories say that high-paid employees are replacing low- and middle-income employees. This replacement might come from employers’ attempts to cut personnel during the recession, rather than payroll spending. For example, employers might have worried about health insurance and other employment regulation whose costs are proportional to the number of employees they have. In this view, the bank bailout did little to prevent layoffs. Some of the replacement could come from families, as they react to some new incentives presented during the recession. Unemployment insurance reduces incentives for unemployed people to accept a new job, because, for up to 99 weeks, the insurance pays them for being unemployed. Unemployment insurance benefits are capped, so the disincentive is much less for people making $2,000 or more a week than for people making less. Some homeowners with underwater mortgages may react by earning more, while others earn less as they recognize that all their extra earning ultimately ends up with their mortgage lender. The chart below explores the replacement theories further. For each of the 50 states and the District of Columbia, the chart compares the percentage change in the fraction of adults in the state who make $300-1,200 a week (the middle two-thirds of employees are paid in that range) to the percentage change in the fraction making $2,000 or more. For example, the fraction of Arizona adults earning $300-1,200 was 10 percent lower from October 2008 to September 2009 than it was in the previous 12 months, and the fraction of Arizona adults earning more than $2,000 a week was 29 percent higher. 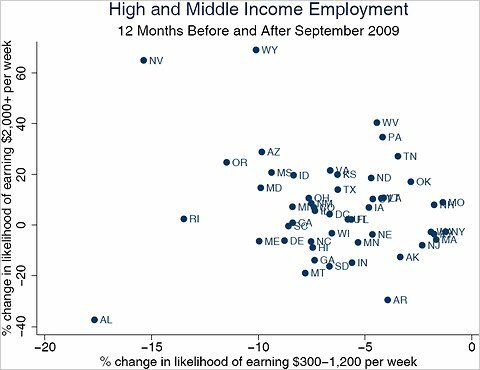 The low-demand and payroll-cutting theories say that the two should be positively correlated, because the states with the largest demand reductions (or the employers most motivated to cut payroll spending) would have cut employment across the board. But the Census data suggest that they are negatively correlated (the correlation is also negative if the small or “outlier” states shown in the chart are excluded or downweighted according to population). These patterns of employment by pay level reveal a number of insights that are not visible in the aggregate employment statistics: the credit crunch and lack of demand may have received too much of the blame for the recession’s job losses. I clearly defined New Keynesian models as "… built on the assumption that employers charge too much for the products that their employees make and are too slow to cut their prices when demand falls" in which the recession originated with a surge in "the demand for safe assets." "Debt overhang" was absent from my definition. I claimed that, according to those models, our labor market problems would be absent if only employers were charging less for the goods their employees make. "Price stickiness" stops them from doing so. Assuming the New Keynesian models were correct, I offered a calculation of what the CPI would have been if prices had been fully flexible. I claimed that, with the passage of time, prices and wages in the New Keynesian model would fall, thereby moving in the direction of what a fully flexible CPI would have done. Professor Krugman would have his readers believe that, among other things, none of the above items are correct. My purpose here is to provide further evidence on items 1-4 so that readers might decide for themselves. Definition. By "New Keynesian," I had in mind neoclassical growth models with flexible wages but augmented with Calvo-type staggered price setting (I have written separately about sticky wage models). According to Clarida, Gali, and Gertler's 1999 Journal of Economic Literature article, those setups are workhorses in the "New Keynesian" (their terminology, not mine) literature. More recently, Woodford (2010) used such a model to characterize the government expenditure multiplier and Eggertsson (2010) use such a model to describe the recent recession as a consequence of a time preference shock (and perhaps also in increase in the willingness to work). In case you are wondering whether Professor Woodford and Dr. Eggertsson have received Professor Krugman's seal of approval, click here and here. The Clarida, Gali, Gertler survey, the Woodford paper, the Eggertsson paper, and many other papers that call themselves "New Keynesian" feature sluggish price adjustment, and make no mention of "debt overhang." A number of economists, including myself, have written about debt overhang in FULLY FLEXIBLE price models, and did not describe their analysis as "New Keynesian." I think that debt overhang has a lot to do with this recession, but nothing to do with New Keynesian economics. So I see absolutely no reason to revise the accepted definition of New Keynesian. If only prices were flexible. In order to see that my claim (2) is correct for the above defined models, take a look at Eggertsson (2010), p. 8. His equations (21) and (25) describe the impact of the time preference shock (embodied in his rs*) on output and labor. In each equation, the size of the impact depends on the speed of price adjustment as parameterized by k. The more flexible are prices, the larger is k. Think of fully flexible prices as k à¥. Equations (23) and (25) show that a time preference shock of a given size has no effect on labor in the fully flexible price limit k à ¥. In other words, the model blames the recession on the combination of sticky prices and the time preference shock: eliminate either of those, and there would have been no recession. Fully flexible hypothetical. Assuming for the sake of argument that the recession is to be blamed on price stickiness (i.e., labor would have followed its previous trend but for price stickiness), I calculated the flexible price hypothetical by using a money demand function that relates the quantity of money to the price level, output (which is the same as labor in Eggertsson's model), and nominal interest rates. The percentage gap between actual and hypothetical CPI is equal to the percentage gap that labor has fallen short of trend (about 10) times the income elasticity of money demand (about one) times the elasticity of output with respect to labor (about ¾) plus an interest rate term (I assumed that money demand is insensitive to interest rates in the relevant range). Deflation will continue as long as the recession does. I gave the intuition in my original article, but that's too much "bar talk" for Professor Krugman, so let's look at Eggertsson's equations again. His equations (23) and (25) say that the inflation rate has the same sign as the deviation of labor from its steady state. 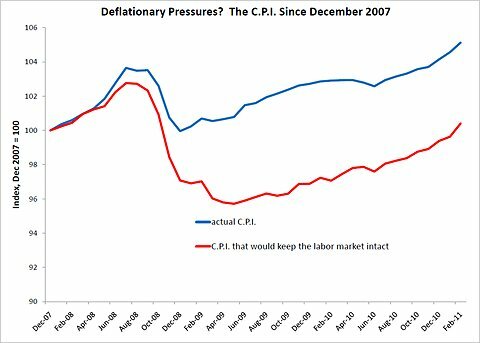 Since a recession is a negative deviation for labor, inflation must be negative. For more of my critiques of New Keynesian models of recessions, see here and here. Normally the Federal Reserve could expand the money supply to satisfy the extra demand for safe assets, so consumer prices wouldn’t have to fall to maintain employment. But the financial crisis was severe enough that the Fed’s best efforts would not be enough. At the time, New Keynesian fears seem to have been realized: consumer prices had to fall to maintain employment, but too few employers were willing or able to make the price cuts quickly enough. The result was going to be a severe recession that could be partly cured, in the short term, by fiscal stimulus or, in the longer term, as more companies had the time needed to cut their prices. 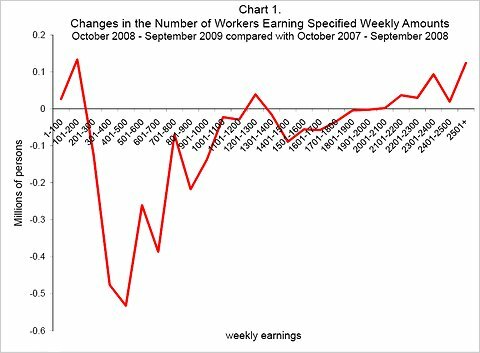 The red line in the chart below shows the consumer price index that, according to New Keynesian theory, was needed to maintain employment. I have rescaled the index to be based in December 2007, when the recession began: a value of 96 means consumer prices were 4 percent below what they were in December 2007. The blue line shows actual consumer prices. We readily see the “downward pressure” on consumer prices at the end of 2008, because, in fact, prices stopped rising and actually fell a couple of percent. But New Keynesians say that with the eight percent drop needed to maintain employment, the blue line needed to fall as much as the red, and a drop that large would take more time. In the meantime, employment would be low and employers would enjoy cheap labor for a while, as so many unemployed people were desperate to work. 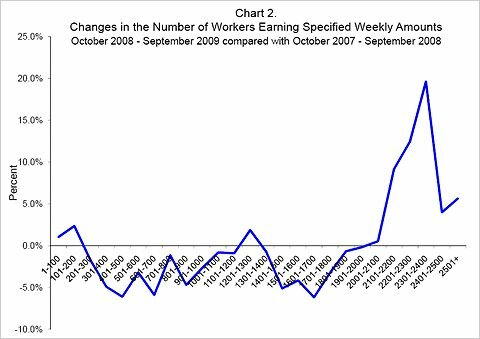 But the availability of cheap labor would eventually give employers room to cut their prices – in theory the blue and red series would converge and employment would eventually return to previous levels. Early on, I thought the New Keynesian theory was wrong because I didn’t see that employers perceived labor to be cheap. Federal law had increased minimum wages three times in and around the recession. A number of other public policies made labor more expensive. My fellow blogger Nancy Folbre has written that American labor looks increasingly expensive compared with potential workers abroad. The price chart above shows little or no tendency for the blue series to converge with the red one, because, contrary to the theory, high unemployment rates have not caused employers to perceive labor as cheap. The low employment rates we have today are too persistent to be blamed on price adjustment lags (I have similar reservations about another business-cycle theory: “job search” theory says that jobs are there to be found, but that unemployed people have not been lucky enough to look in the right places). Our labor-market problems may not disappear by themselves and are not addressed by New Keynesian theory.